Centenary Motors Group is one of Brisbane’s leading Mazda and Mercedes Benz dealership. 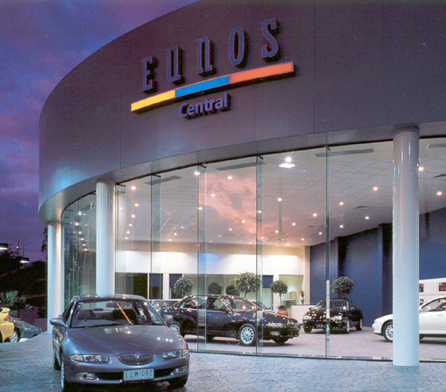 Wiley was engaged to design and construct a state-of-the-art automobile showroom and service complex that would reflect the standards of excellence of the Mazda Eunos range. Wiley was chosen for its compatibility with the culture of the client firm, particularly its commitment to excellence and its willingness to strive for the optimal project result. Creating a complex with maximum visual impact on a prominent corner site. Satisfying the discerning Eunos customer’s expectations of first class product, presentation and after sales service with the design and construction finishes. Redesigning the traditional workshop concept to create a service area that offers exceptional operating efficiency, cleanliness and corporate presentation. Special planning and coordination of deliveries and subcontractors resulting from the lack of main street access to the site. A spectacular design featuring a structural steel frame and 4.5 metre floor-to-ceiling glass panels to capitalise on the site’s highly visible location. Use of Eunos corporate colours throughout the complex. Inclusion of specialised lighting that highlights the quality of cars on display and reduces use of electricity and air conditioning. A post-tensioned concrete reinforced floor slab to create a 15 metre ‘clear span’. Hoist areas with fully grated drain areas to reduce build-up of oil, brake fluid and brake dust. Stainless steel work benches with built-in parts washers, waste disposals and sink clean areas. 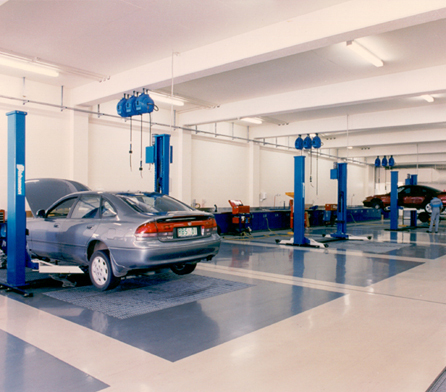 A dust-free area for repairing major car components. 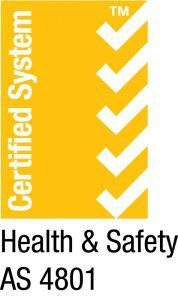 Organise and manage all aspects of the construction. Wiley delivered a high quality, visually appealing automobile showroom and service complex featuring state-of-the-art technology and design elements which matches Eunos standards of excellence and gives Centenary Motors Group a strong market presence in Brisbane.